Did you ever hear about “full frame”, “APS-C”, “Micro 4/3”, “1-inch”, “1/2.3 inch” when you are choosing the camera? Did the sales person tell you “This DSLR provides better image quality than the P&S because it equips with a larger image sensor”? Or “This camera has a crop factor of 2, so blah blah blah…”? Before we discuss the topic today, let’s have some idea about the different size of those image sensors. The comparison chart is scaled with the actual size of an image sensor. It shows the name/size of each image sensor follow by the crop factor in the bracket. I omit some “not-so-standard” sensor size (e.g. Canon has a slightly different APS-C format which has a crop factor of 1.6) to give a simpler comparison chart. And now we continue to see how the image sensor size affect our cameras. Usually, larger image sensor is equiped in larger camera system. It is because larger sensor needs larger lens to allow enough amount of light to enter. Due to the advanced of technology, we can even find the Full-Frame image sensor in the small P&S. However, full frame P&S is very rare and extremely expensive compare to full frame DSLR. So the following P&S are referred to those P&S cameras that equip with 1/2.3″ image sensor. Take the full frame image sensor as the base size, the crop factor is result of the base size divided by your camera image sensor size. When you have a full frame camera, the base size divided by your full frame camera image sensor size is equal to 1. Therefore, the smaller the camera image sensor size, the higher of the crop factor it has (Please do the math yourself ). Crop factor affect the angle of view of the image (control by the focal length), same focal length on different image sensor size will result in different angle of view, you can see the different from the comparison below. 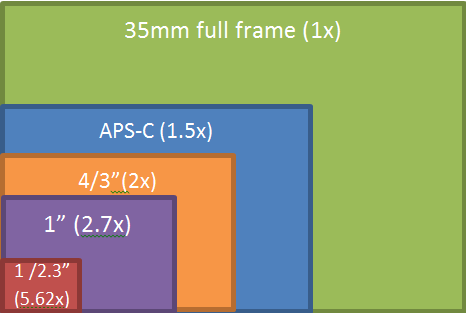 Even though both APS-C camera and P&S camera are using 24 mm to take the shot from the same tripod, but when you multiply the crop factor to the lens’ focal length to get the 35 mm equivalent focal length, you realise that the 24mm actually gives 135 mm on 1/2.3″ P&S camera and 36 mm on APS-C camera, which is a huge different! Crop factor also affect the depth of view of the image (control by the aperture), a F2.8 lens of a 1/2.3″ image sensor really means a F2.8 on P&S camera, but when come to the depth of view, it is actually producing the image result that equivalent to F 16 on a full-frame camera! In simple explanation, if you want to get the same image result from different image sensor size camera, you need to multiply the crop factor to BOTH of your lens’ aperture and focal length. Most of the time, lens manufacturers will only tell you “A 16-70mm F2.8 APS-C lens has a 24-105mm of focal length in 35 mm equivalent”, so that you thought you will get the same image result from full frame “24-105mm F2.8” lens, that’s a big NO! Remember, you need to multiply the crop factor to BOTH of your lens’ aperture and focal length to get the same 35mm equivalent image result. So a “16-70mm F2.8” APS-C lens will only get the image result that equivalent to “24-105mm F4.3” full frame lens, NOT “24-105mm F2.8” full frame lens! The larger image sensor size is, the higher price it is. Besides, the larger image sensor size in the smaller camera body, the more expensive the camera is. As what you can get in the current market, when you choose the camera with the same camera system, that’s say in DSLR, a full frame DSLR is more expensive than an APS-C DSLR; While you choose the same image sensor size camera across different camera system, a full frame P&S is much expensive than a full frame DSLR. In general, larger image sensor provides lower noise level that gives you a cleaner and smoother look of your photos (aka better image quality). For the same amount of pixels (e.g. 12 pixels in the example below), larger image sensor has larger pixel size, yet it allows to receive more flux of photons at the same amount of given time and settings. Smaller image sensor camera needs smaller lens to exposure the whole sensor, so it’s so common to see those 20x zoom (e.g. 25-500mm) F 2.8 on P&S with such a compact size. If you want a 25-500 mm F 2.8 lens on full-frame camera? Then you will have to carry a lens that has the similar size to your leg (I assumed that you are adult)! However, please recall about the crop factor I mentioned just now, the depth of view of the F2.8 lens on P&S is only equivalent to F16 on full frame camera. The image result that taken by a P&S and a full frame camera will never be the same. So when your camera has larger image sensor, then you will have to carry larger lens for it. It results in larger total camera size and decrease the portability of your camera. That’s all for today. Hope the reading has gained you better understanding. Feel free to left your comments here if you have any opinion or correct me if I made any mistake.